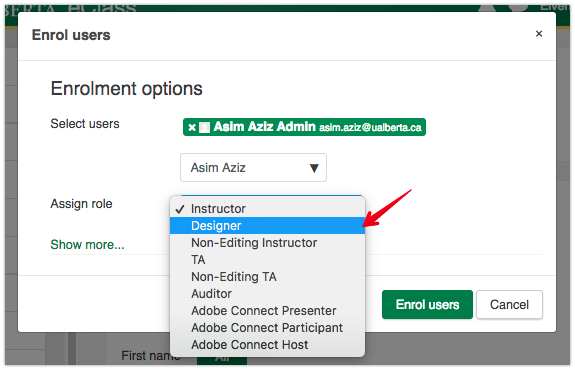 If you are enrolled as an instructor in an eClass course, you can follow the instructions below to add colleagues into your course in any of the different roles available: Designer, TA, Additional Instructor, Non-Editing TA (Graders), and/or Auditor role. For a broader description of these various roles and what they should be used for, see the following article. 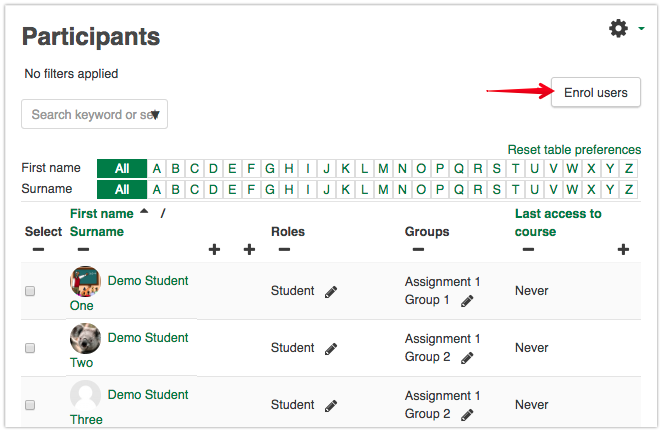 eClass allows users to be enrolled in courses in multiple roles but bear in mind that permissions are additive (so if enrolled as auditor and instructor, your colleague would have full instructor permissions). 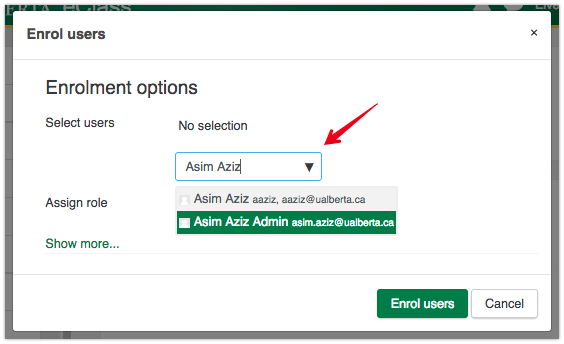 Note that you will not be allowed to enrol students in your Beartracks Credit sections -- student enrolments are automatically synched with Bear Tracks each day based on your course Beartracks section information. It can take up to 48 hours from the time a student is enrolled in Beartracks by the department until they appear in eClass. 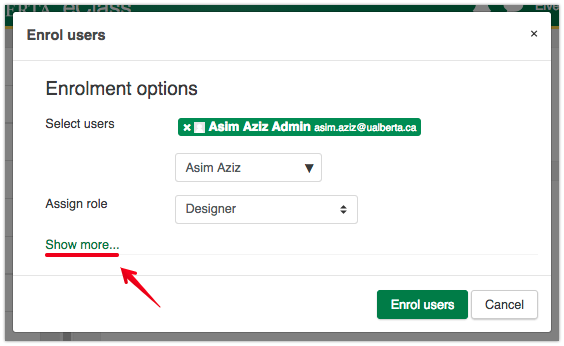 If a student does not appear in your Participants list after this time interval, please contact IST eClass support team at 780-492-9372 or eclass@ualberta.ca. Log onto eClass and enter the course where you need to enroll someone. New in 2018, the Participants and Users areas have been merged. 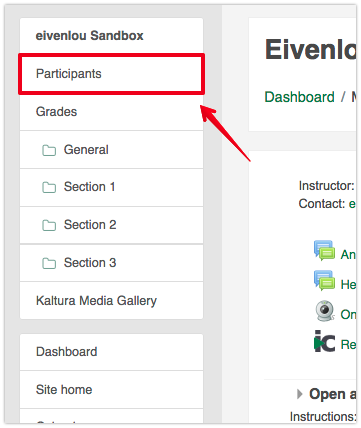 To open a list of existing users in the course, click on Participants in the navigation panel near the top left. This is now the recommended method for accessing enrolled users. 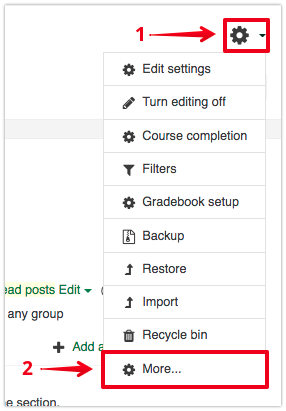 Click on the gear icon on your course main page, then select More. Once you are on the Participants page, click the Enrol users button. 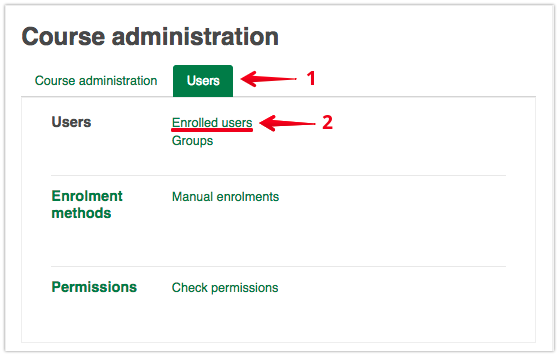 Note: if there is no Enrol Users button, you will need to add the Manual enrolment method first by following the steps in this article: Enabling the Manual Enrolment Method. In the 'Enrol users' dialogue box that appears over top of the page, first type the user's first and last names or their CCID in the box provided. This will filter the users based on the names you entered. Note: if you are having problems finding a particular user, consult the following article: Problems Finding Users to Enrol in Your Course. Then, select the desired role from the 'Assign role' drop-down menu. Optionally, an enrollment duration can be set for a user’s enrollment. This can be useful when, for example, a designer only needs access to your course for a couple of days to add content and should then no longer have access. 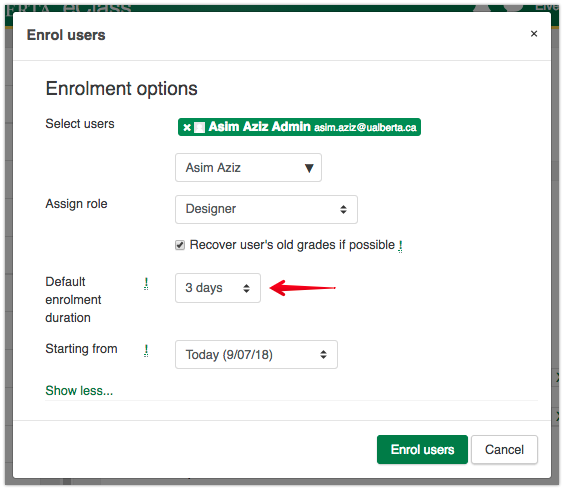 Setting an enrollment duration means you do not need to remember to come back and un-enroll the user later. Click on Show more... to see the advanced enrollment settings. Here you can set the Enrolment duration. The default value is Unlimited. Make sure to complete the steps 6-7 above (selecting the role and settings an enrollment duration if using). Click on Enrol users when finished. After you have clicked Enrol users, the enrollment process is complete, and those users you enrolled will appear in the course 'Enrolled users' list.